At first blush, Little Nightmares resists the horror label. A platforming puzzle adventure from Tarsier Studios, the game puts players in the role of a little child named Six as she runs, crawls, climbs, and jumps on a quest of liberation from The Maw: a subaquatic prison populated with grotesque monsters. Unlike the celebrated gems of horror game cannon, Little Nightmares is not a shooter, it doesn’t rely on survival mechanics, and even though the level and monster design is upsetting, it’s also very cute in a Necronomicon-meets-bedtime-storybook kind of way. It’s not scary on the surface, just very macabre. But Little Nightmares is a truly disturbing interactive experience. It immerses players in a world of corporeal horror, cranking the dials on our physical senses to amp-up our empathy with Six. Puzzles, characters, environments, and controls activate our bodies to create physical symptoms of hyper-aware anxiety, so when the creep-outs, jump-scares, and mad dashes from Ito-esque horrors punctuate Six’s escape, we truly feel them. 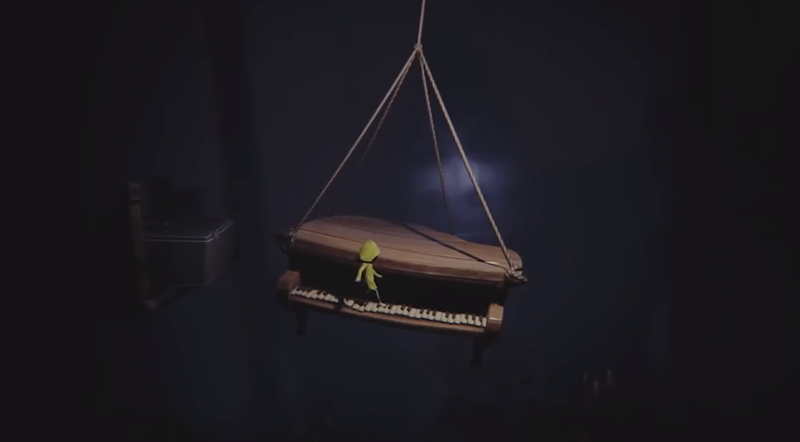 The symbol of the eye is ever present in Little Nightmares. From the logo, to the autosave icon flashing in the corner of the screen, to design elements of The Maw itself, there is no escaping the image of eye. Moving through the dramatically lit environments, an atmosphere of observation hangs over Little Nightmares like a floodlight. But that’s not to say the game is always visible. 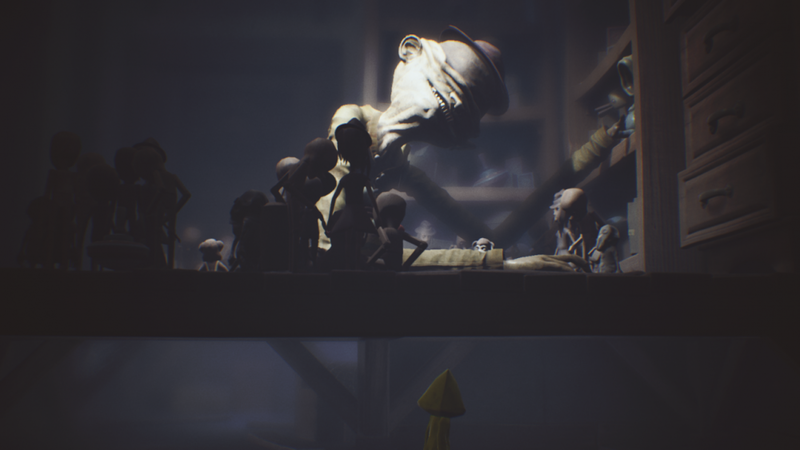 While Little Nightmares is played from a third-person perspective, players are limited by Six’s own inability to see in the darkness that pervades The Maw, which sometimes becomes so inky that she must light a zippo lighter to progress, even if such an action catches the eyes of an enemy, or two, or twenty. The sense of being watched is crucial—Six is on a sneaking mission, and to succeed the player must imagine if she can be seen by her enemies. We must see each level through our own eyes, Six’s eyes, and the eyes of the monsters who would devour her if we want to succeed. The sound design in Little Nightmares made me shudder with its unpleasant volume and uncanny foley (think sacks of meat being dragged across rough, splintering hardwood). But sound is not optional in this bad dream. To succeed, especially in the early chapters of the game, we need to use our ears to detect the proximity of monsters, while remaining quiet enough to get by unnoticed. Six uses sound as a tool, too. In the chapters that have Six sneaking past the malformed Janitor and filthy Twin Chefs who staff the lower levels of The Maw, we can create sounds as diversions, tactically throwing a windup toy from a shelf to lure a monster away from a doorway. During one specific encounter in a room of broken clocks sound becomes camouflage. Moving during the cacophony of multiple clock chimes crashing, Six can evade the open ears of her pursuer, the Janitor who uses non-visual means to search for Six. Speaking of the Janitor, that particular monster is responsible for one of the more iconic symbols of Little Nightmares: a spidery hand attached to a long arm, blindly feeling around for a hiding child. Watching the Janitor at work in his utility rooms or the library, his probing feelers force us to consider touch as we try navigating to safety. In Little Nightmares, touch is used to hook the scares into our skin. The environments require Six to climb for salvation, so as I solved the puzzles of The Maw I constantly obsessed over environmental textures. Exposed rebar, the lips of stacked porcelain dinner plates, towers of old hardcover books—can I swing from the slab of meat hanging from that dangling chain, or will to be too slippery? The most uncanny aspect of the game is communicated through touch, though admittedly it won’t affect every player. Tarsier Studios contributed to the all ages, family friendly LittleBigPlanet games, and developed the mobile version of the game LittleBigPlanet PS Vita. 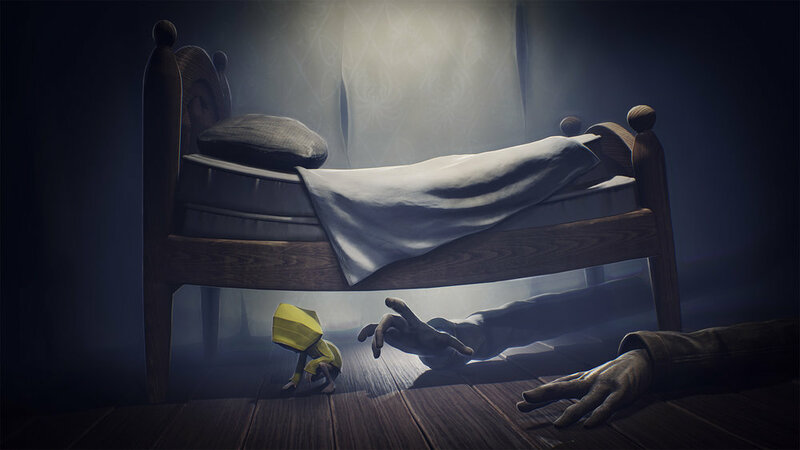 Little Nightmares uses the same control scheme as those cute-as-buttons (literally) games, so for players like me, for whom LBP represents about 40 hours of innocent fun, the in-hand experience of tactically interacting with The Maw feels horrid, like returning to the site of a childhood memory only to find it's been turned into a mass grave. Taste and smell are elusive senses in art, especially in games, film, and TV. When our gateway into a story is a scentless HD screen, the mouth and nose have to be reached by sneaking through the windows left open by other sense organs. In Little Nightmares, touch, sound, and sight bring smell and taste to the party. Early on (and in many of the game’s promotional materials) the theme of food becomes abundantly clear. The children held in The Maw are being processed as human veal for glutinous guests. Food objects litter The Maw, which itself evokes the image of a gaping mouth, and is made up of its fair share of butchers blocks, meat freezers, and dining tables. The images of food and eating come into sharp relief as Six is plagued with hunger attacks, which limit her movement and shake the controller, but she refuses to eat any of the abundant root vegetables and sausages laying on countertops and shelves. Smell is tied to the food imagery of Little Nightmares. Steam rises from cooking pots and warm glowing ovens conjure the smells of roasting meat. But beyond that, there is the smell of richly coloured environments. Varnished wood in the guest areas, dusty linens in a bedroom near the prison’s exit—these may not normally carry a scent, but thanks to the terrible SNIFF of the eyeless Janitor as he searches for Six early on in her adventure, the sense of smell is forced into constant consideration. The experience of fear is physical. We feel it, we see it, smell it, taste it, and hear it. In the process of being scared our hearts race, our skin tightens and our eyes widen. We want to survive whatever terrible encounter jolted us from comfort. In storytelling, this reaction can only be achieved through empathy. Art possessed our corporeal form, reminds us of our bodies, then introduces danger. Little Nightmares is the best of this sensory art, inviting us to fully embody the impossible before feeding us to the monsters.